There has been a lot of speculation in the media regarding the launch of a limited edition Mehran VX in Pakistan. However, Pak Suzuki’s Customer Relation Center (CRC) has denied the speculations. While the production of Mehran can be confirmed, the launch of a limited edition Mehran VX. There is currently no news regarding the launch or the features of the Mehran VX limited edition for now. The rumors started circulating after a circular surfaced which confirmed not only the launch of the limited edition Mehran but also its features and price-tag. According to the rumors, limited edition variant of Mehran VX will come with the AC feature and in white, silky silver and graphite grey colors. The price of this limited edition variant will be Rs. 825,000. However, Pak Suzuki CRC has denied these rumors. Not only that, back in July 2018, the company officially confirmed the discontinuation of Mehran’s VX variant. It remains to be seen whether the company will make a public statement regarding these rumors or not. Stay tuned for more updates regarding this matter. Yes, it will indeed remain Mehran, i.e. most unsafe and overpriced vehicle in Pakistan, with no safety features at all. The only reason it has survived so long in the market is the buyers’ inability to afford better(more expensive) cars. Now that there many other better cars with a similar price tag in Pakistan, and with Suzuki raising prices as much as twice a year, they can kiss a good bye to their hold on automobile market. Mohammad shoaib sb There are so many products in market that are over priced and unsafe. What you say about those? I think you are a user of aru-model japanese cars with over priced spare parts. My analysis or feedback about Mehran or any car is not based on what car I own. TBH, I own Suzki GS150 bike and still do criticize Suzuki for their lack of interest in improving their cars’ quality and not introducing new tech. There are other over priced cars and those too fall in the same category. Even that does not give Mehran an exemption from criticism. Features? You people are always clamouring about technical driver assists but, tell me? How many of you people actually even wear a seat belt? 60% to 70% do not even have the sense to use it even with the freaking tone badgering you. Why then? Should the company offer it? It is a general marketing and business rule; save costs and avoid offering features that the market does not care about. Who are these “you people” that you are referring to, friend? People who are commenting, sorry if it sounded rude. This car will take Suzuki down and out of Pakistan. The demographics of Pakistan has changed exponentially, and now with Korean, Chinese, German, Italian and American automobile players in the local Market even the current Suzuki product line is not enough to compete. If they take action now and introduce their most advanced tech into the market they are good to go, otherwise it’s a dead and good bye for them. I don’t think so, you see, over 55% to 60% people trust in the brand name and a proven track record which, for your remembrance note is not a good one when it comes to cheap and pathetic Korean cars. My cousin is still crying over his Santro, the damn thing’s sensor setting is a difficult thing to look through for a simple mechanic, further, it’s body is also not able to deal with humid and polluted weather of the Karachi, big wholes in the floor? Admittedly he is lazy when it comes to regular servicing but so, In contrast, the 2008 Cultus may not be as gizmo’s box as a Santro, it nevertheless is far cheaper to run and a less pain in the head. And let’s accept it reasonably, people of similar nature are working in Suzuki and since, you are indifferent to the peoples’ misery, so are they, that is to say, our brothers’ actions reflect ours’ and while might feel pious while raising a finger on them then remember the rest four fingers are turned toward you. Well a bit of advice for my Bro, talking about fingers I never raised any to anyone except feedback for Suzuki. Back in the days when Android phone was launched, I gave some comments about Nokia and Blackberry and people like you resisted same way as you do today. Now that advice for you is that do research about Korean Car Makers, you are comparing Santro with Cultus and I don’t know how you get into your very own conclusion. Please ask your cousin to get a proper mechanic who does understand sensors. Suzuki is not even considered as a Rikshaw in 1st World Countries. Just visit Dubai and see for yourselves how many Suzuki’s you find there and how many Toyota’s running as a Taxi. KIA motors a KOREAN car company is still No. 1 automobile maker in the World. And you can’t compare a discontinued Santro with over continued Cultus. When Santro was launched it was the only EFI based 1000cc car with computerized design and sensor-based throttle controls along with electronic power steering. They were far ahead of Suzuki tech at that time and still, they are miles ahead of them. If our illiterate mechanics don’t understand the tech you considered it lethal to blame the manufacturer. Wahhh..! My dear, please be informed that in 2005 Santro wasn’t the only car that had an EFI engine further, my cousin does not go over to any road side mechanic Mister, his regular car checking person is in-fact Fay motors. It is you, you just cannot digest a simple fact that for Pakistan conditions are very different; badly built roads, unethical people, family values. And also there is a fact; you tend to disagree with persons who do not have the ideas that you form in your head, based on your personal likes by the way. While, about that feedback of yours on Android or Nokia; well, I don’t care because I have never been a Nokia fan and that consumer change does not relate to the auto-mobile industry in the Pakistan, as it is a developing and not a 1st world country, nor, people in Pakistan can afford to have their cars repainted after three to five years as happened with this Santro and a KIA Pride (Embarrassment). Besides, there are people like myself who want cars to remain simple, decent looking and easy to drive and such people are in abundance still. Shake your head all the while, it is your opinion but a stark truth is Isuzu D-Max, many people at its launch were claiming that it is going to roll the Toyota Hilux, how many months ago it launched? Eight months or round about, where is it? Parked on the showroom floors I guess. As for other EFI cars in 2005, Suzuki Baleno, launched in 99 came fitted with an EFI engine, I guess you too need to find out more about brands other then just the KIA. Anyway, we used this Baleno personally for ten years and in the conditions that a failed Korean car can hardly have the built-up to last half as long as a Baleno. Oh, one thing, an illiterate pathan can identify problem in the Baleno, so, the problem is KIA not our mechanics. By the way, have you forgotten about Sportage? I still remember well how busted an engineering example the Sportage was. You say that a Toyota is running as a taxi in Dubai, so, what about it? It is also torquing through the streets of Karachi with that big dish antenna type thing used by TV channels, this is not a bad thing. To the contrary, it shows the level of an engineering that Toyota employs in building a strong family vehicle. The point is, Toyota and the Suzuki have never been known for design or technology rather, their image comes from remarkably well built, durable vehicles. I notice you pitching KIA as a number one brand in the world, again may be to you it is, based on your findings but, can you then care to explain that why the Prius despite being expensive from the competition is outstripping all the other cars? Why, the Corolla remains a preferred vehicle? If KIA has been given awards for design or reliability then that does not mean it is a durable ride. Though, admittedly, the Toyota instead of relying on its past image of creating reliable and long-lasting vehicles is rather setting store around design, and in doing so, is failing its original fan base but, at the same time is not being able to win over design centric people either. 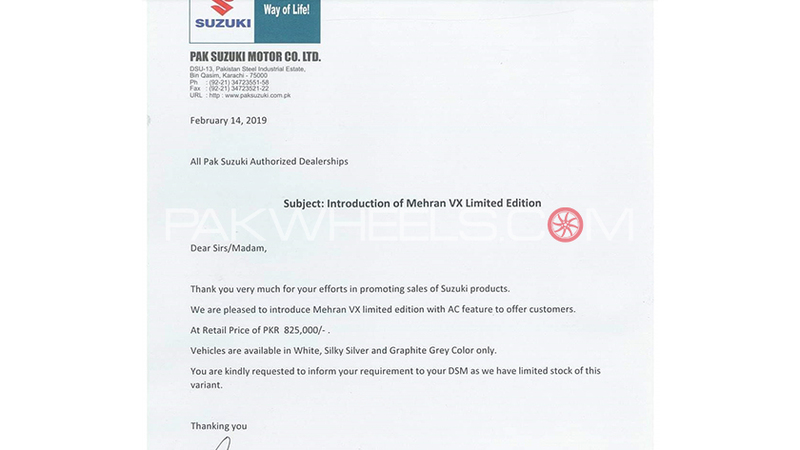 Well on Pak Suzuki’s website the 3rd variant of Mehran is appearing, “Mehran VX Limited Edition” worth PKR 825,000. They surely won’t put a rumour on their website.